Since 1948, Fountain House, a social service organization located in New York, has been dedicated to supporting people with mental illness in achieving a normal and productive life in society. The core principle is based on members participating in workday activities which contribute to the function of the organization and provide opportunities for members to live, work and learn in a community of mutual support. This ‘Club House’ model has been adopted in affiliated houses in more than 120 cities around the world. Statistically people with mental illness have on average a 25 year shorter life expectancy than the population at large. To counter this tragic statistic, the Peter B. Lewis and Adam Lewis Wellness Center at Fountain House was created to foster better and integrative physical health though education and lifestyle changes. This program places Fountain House not only at the forefront of mental healthcare but also positions the organization within a national movement that promotes physical health in support of mental health. We were asked to repurpose the existing top two floors of the New York Club House with an emphasis on light, air and proximity to nature. A multi-purpose court at the heart of the project emphasizes the program goals of community and support. The large open area provides collective space for meetings and larger gatherings while custom furniture offers flexible work areas for members and staff. Adjacent, a commercial grade kitchen was designed to promote nutritional awareness and teach healthy cooking. The program turns to fitness with a variety of supervised classes and workshops in integrative health. 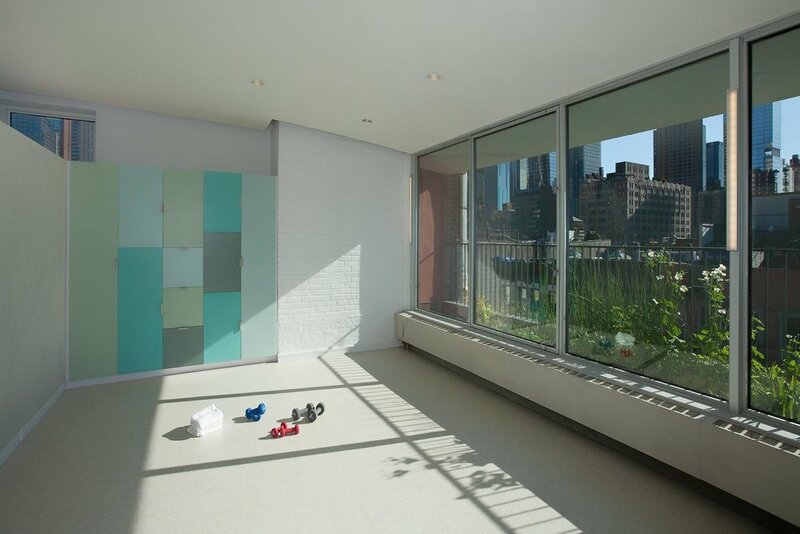 A loft with gym equipment, complete with new shower facilities, offers an inspiring view of the city skyline and a smaller boxing/martial arts studio overlooking the court below is sheathed in frosted glass panels. Elskop Scholz is proud to have received a citation from Behavioral Health Care Magazine, as well as an award from the Boston Society of Architects for the Lewis Wellness Center.